Last week when you were tweeting along to The Sounds of Music Live! because you thought it would be hilarious or bad or hilariously bad, Julie Andrews was giving a speech and not caring about silly pop culture events because she's just that classy. You should be ashamed of yourself, person-who-thought-you-were-the-only-one-to-write-"The Hills Are Alive"-jokes. 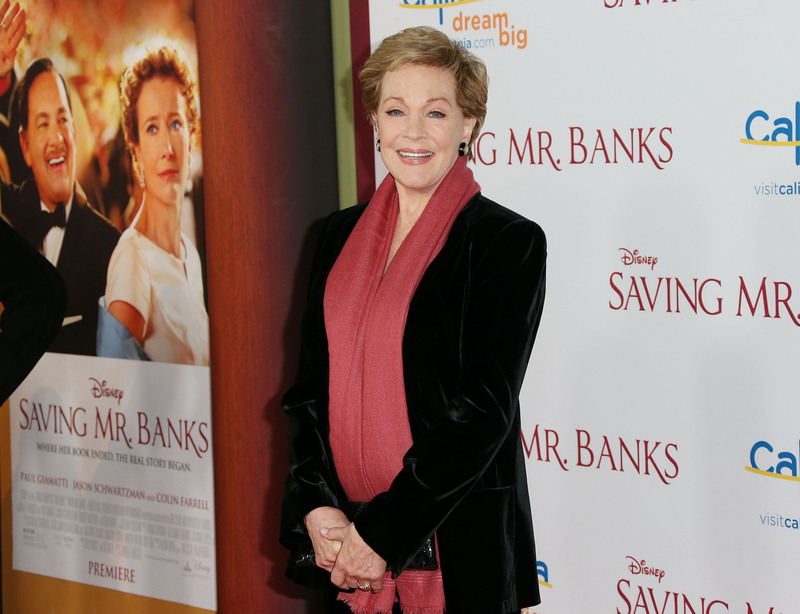 This past Monday night at the premiere of Saving Mr. Banks, Andrews told reporters, "Alas, I did not (see it). I had a speaking engagement and I couldn't. But my kids did record it. I'll get around to it." The whole quote is so awesome: from her use of "alas" (classy!) to the fact that her excuse was a "speaking engagement" (sophisticated!). And she's so nonchalant about missing it. Julie Andrews obviously does not have debilitating FOMO (fear of missing out) like the rest of us. The other day when I saw that SoML was available On Demand, I was like, "Who the heck will watch it at this point? It's so passé now." Well, Julie Andrews is the person that will watch it and she'll watch it when she damn well feels like it! Personally, I tuned in because I wanted to be a part of what would surely be a cultural juggernaut the likes of Sharknado. So... a cultural juggernaut that last's for, like, four days. I made it through about 20 minutes before I couldn't take it anymore, but I still read the tweets and a funny, but very long, recap. Now, in light of Julie Andrews comments, I feel a bit ashamed. I feel like I need to go to some sort of entertainment rehab. "Hi. My name is Lia and I have fear of missing out on ridiculous TV movies, award shows, and, ya know, whatever Miley's up to lately." Julie Andrews would, of course, lead the meeting and sing calming and inspirational songs to everyone. I know Andrews said her kids recorded it, but maybe you weren't so lucky. In case you're interested, NBC will be re-airing Sound of Music Live! this Saturday at 8pm. Figure out your drinking games or decide on your I'm-too-cool-for-this-like-Julie plans accordingly.